That delightful fellow to the right, dear readers, is the Krampus. Think of him as the anti Santa Claus. He’s the one that delivers switches and coal to the bad little girls and boys. And if they’ve really been bad enough, he will put them in a sack and take them back to his lair. 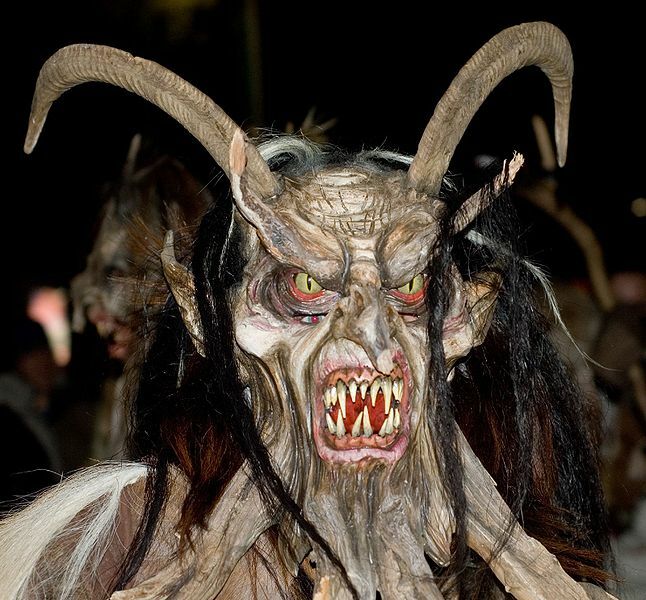 This is the time of year that the Krampus arrives to Bavarian regions and cities, shaking rusty chains, ringing bells, and reminding kids that they better be good for far more than goodness sake. It’s the rather darker side of Christmas that doesn’t make its way into the American traditions, pagan rights that were pushed aside as the holiday was turned from a festival of darkness into a festival of light. Traditions that date back to when this time of year was about fearing for the dying light and railing against the lengthening night. It makes all the sense in the world that this is when demons would walk the earth. To hell with Halloween, night on Christmas is roughly 30 minutes longer. Which is far more cold miserable darkness to peer out the window and wonder just what might be out there, prowling. Unseen. In the Netherlands, as made famous by David Sedaris, Santa does not arrive with the Krampus. Saint Nicholas, Turkish bishop now living in Spain, arrives instead with six to eight black men. These men will kick them, beat them with switches, and collect the naughtiest children and take them back to Spain. I’m not entirely sure if this is meant to be a punishment. It all depends on which part of Spain. In the United States the punishment for naughty children is to not get any presents from Santa. Which is largely an empty threat, one that I doubt many parents actually follow through on. Coal is threatened, but only as a supplement, a hollow warning that has none of the actual deterrent power of beatings and demonic kidnapping. And so the entire notion of behavior-based rewards to break down. Be nice, or Santa won’t bring you any gifts, except he will anyway. That’s not a life lesson. Behave or a horned demon with long fangs and glowing yellow eyes will stuff you into his sack and take you back to his lair in the mountains. I think that’s a story that better prepare anyone for the trials of this modern life, and provides much more incentive for good behavior. This is really what happens if you let a horror writer loose with international Christmas traditions. So let’s all be good, at least for a few weeks. At least while he’s prowling the lengthening night, looking for those who are misbehaving. Because the Krampus has plenty of room in his sack. Krampus photo retrieved from Wikipedia. Originally released to Creative Commons Attribution 2.0 Generic license by Flickr user Annia316.